Now that it's October I'm officially on the countdown to Christmas! However while I don't think I can get away with getting the tree out just yet, there are other ways in which you can update your decor according to the changing season. 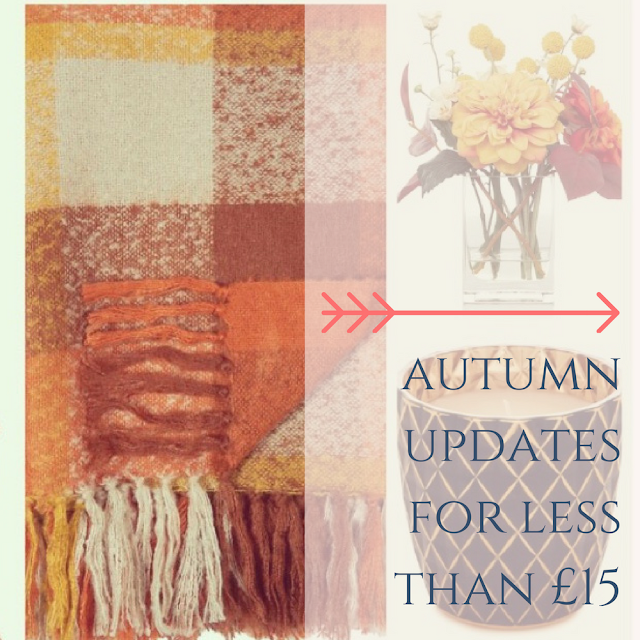 So here I've picked out some of my favourite autumnal bits available on the high street now, which will 'cosy-up' your home get you in a more wintery mood, without breaking the bank. One of the quickest and easiest ways to do this is by injecting some deeper, more autumnal tones into your interiors - think deep reds, burnt oranges and even hints of gold. One of my go-to ways to create a cosy feel in my home is to use fairy lights, and for £1.50 for this string of 20 from Primark, you really can't go wrong! How about dropping some into this stunning tealight holder, and dotting some wintery looking candles about? Animals seems to be a big theme for Autumn/Winter, and at just £5 each these cushions from Wilko would make the perfect update for almost any sofa, and who can resist those mugs?! Nothing says Autumn more than this stunning pumpkin-y burnt orange colour, which George at Asda seems to have got just right this season. I can just imagine snuggling up under that gorgeous blanket with a hot chocolate, and at just £8 each, why not update your lounge with the matching cushions too? A dash of pot pourri will give off a beautiful wintery fragrance in your home too, and how cute are those fox bookends?! I just had to include them here. There's nothing like a scented candle to create the right atmosphere in your home, and these ones from Next come in the most delicious-sounding fragrances (figgy pudding, gingerbread, cream liqueur, mistletoe, roasted chestnut & mulled wine). If orange isn't your thing, why not update your sofa with these gorgeous green cushions, and I'm totally obsessed with all things pine cones when it comes to winter decor - how lovely does this display look with the fairy lights too? Finally I have to mention these beautiful artificial flowers - I always go faux when it comes to flowers in my home, and these are just the perfect autumnal display. Hope this has been helpful for anyone wanting to inject a little winter warmth into their home - how will you be styling your home this season? Tag me in your pictures over on Instagram @dove_cottage, I'd love to have a look! I've been busy putting autumn and winter into our home the past few days, I love this time of the year .. all the exciting of Christmas coming. I've bought a few bits, but have plans to get more, so thank you for this lovely post. You have such a lovely eye. I love you've included things under £5 and wow that candle. I can't wait to see your winter version.